The fourth episode aired in early December and was one in which I participated. This episode, unlike the first three, tells a story with which I am very familiar! In 1943, three boys found a skull in a wych elm in Hagley Wood in the West Midlands. An almost complete skeleton was recovered from the tree by the police and attempts were made to identify the 30-something woman, without success. Over the decades, many rumours, theories, and conspiracy theories have swirled around the story of Bella in the Wych Elm. The skeletal remains disappeared. The coroner's report was destroyed after 15 years. Some of the police files are missing. One can see how the story is fertile ground for speculation! This episode of Nazi Murder Mysteries summarizes the case quite well, without getting lost in some of the more outlandish theories. Its focus rests primarily on the theory that Bella may have been a Nazi spy. Naturally, this touches on the story of Josef Jakobs and Clara Bauerle which, given that Clara passed away in Berlin on 16 December 1942, can be put to rest. 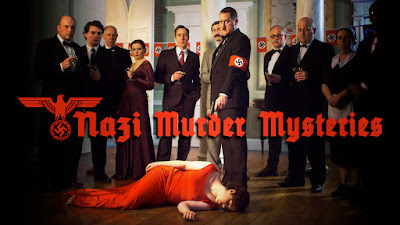 There were a couple of statements which I found a bit of stretch - the idea that there was a Nazi spy ring operating in Birmingham during the war. I haven't found any evidence of that during my years of research. I did find Richard Lund's commentary quite intriguing - he is the son of Dr. Lund, the forensic biologist who examined Bella's remains and the fragments of clothing, etc. found in the wych elm. His comment that the coroner's reports were intentionally destroyed after 15 years (the standard at the time) explains at least one piece of the puzzle. I admit I had trouble following the story of the RAF officer, Osborn. The account of him meeting some Canadian Intelligence officers at the end of the war, officers who claimed to have been involved in the Bella investigation seems a bit far-fetched. Why would Canadian intelligence officers have been involved in the Bella case? If the Bella case was a matter of national security, and the Security Service (MI5) had been involved, would any intelligence officer (Canadian or not) have spoken about it so freely? On the whole, I thought this episode gave a well-balanced account of the Bella story, as it relates to the possibility that she was a Nazi spy. While the story may never be solved... it is certainly an enduring mystery that many can sink their teeth into.